The hi-hats, splashes, crashes and china sound great and work together well. We're not so convinced by the rides, as the finish influences the sound too much (the Mega Bell ride is a different kettle of fish). However, many will find the rides' toppiness palatable and in keeping with the cymbals' bright nature. Overall, the Soundcaster Customs are reasonably priced, exciting sounding and well worth considering. Imaginative and original set of cymbals. Striking looks. The rides could be more varied in sound. Only one china model. 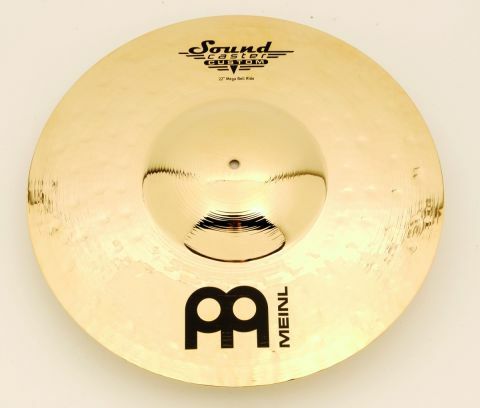 Meinl's Soundcaster Custom cymbals were a follow-up to the company's innovative range of Soundcaster cymbals. The most novel feature of the Soundcaster and the Soundcaster Custom ranges is the B12 bronze alloy they are made from. The two alloys most commonly used in cymbal manufacture are B8 (eight percent tin content) and B20 (20 percent tin). B12 (12 percent tin) bridges the gap between the two. As such, B12 displays characteristics of both, revealing B20 shades of warmth and darkness, while also possessing a bright and lively B8-like edge. The Soundcaster Customs differ from the Soundcaster cymbals by virtue of the brilliant glossy ﬁnish that the cymbals gleam with. Aside from its visual impact, the shininess guarantees to accentuate the top end of the cymbals. The Soundcaster Custom cymbals complement the existing Soundcaster range and the two series are marketed alongside one another. Two splashes, four pairs of hi-hats, 10 crashes, three rides and one china are offered in the Soundcaster Custom range. The cymbals all sport uniform hammer patterns and thin, shallow bands of lathing. The ﬁnish could accurately be described as mirror-like and, when caught under lights, the results are truly dazzling. In general, the cymbals are medium thin in weight and this, combined with their ﬁnish, makes them feel ﬁrm yet slick to touch. Like all Meinl products, these cymbals are immaculately presented. All four pairs of Soundcaster Custom hats available are 14" models. Two of the pairs are regularly shaped hats, while the other two have a crimped-edged Soundwave bottom cymbal. They are further divided by categories of Medium or Powerful. The 14" Medium hats are bright and clean with a pleasingly warm note, and give a good fat crunch when closed. The 14" Medium Soundwave hats are slightly louder than the standard Medium pair, but possess a similar balance of tonal warmth and power. The Soundwave shape is intended to encourage air to escape from between the cymbals at a quicker rate, for a faster response. There is a crispness to the Medium Soundwave hats, yet they retain a degree of smoothness, too. The 14" Powerful hats are substantially heavier, particularly the top cymbal and so are immediately louder. Tonally they are far more aggressive, and verge on the shrill when you are over the top of them. However, their projection is vast and while I found them a little biting, they cut through pretty much anything. The 14" Powerful Soundwave hats are again weighty and high-pitched but seem more rounded than regular Powerful hats. They are still fabulously loud and penetrating and give a great sloshy wash to boot. The Soundcaster Custom splashes come in at 8" and 10". The 8" is extremely quick, very high in pitch and is over almost as soon as it begins. The 10" is a little more intriguing. It comes to life quickly, but beneath the silvery opening sits a deeper and complementary note. The choice of crashes stretches from a 14" model right through to a 20", with one available at every inch in between. The majority of sizes are available in the Medium classiﬁcation (14", 15", 16", 17" and 18"). Powerful crashes take over from 18" to 20", and there are a pair of 16" and 18" Thin crashes. The Medium crashes all display a good mix of brightness and underlying warmth. The brilliant finish ensures they all open quickly, and their consequent decay is similarly sweet. The 16" and 18" Medium crashes caught our ears the most, as the balance of the above qualities was particularly harmonious. The 18" was sufﬁciently deep to give the bell a real voice, making it a contender as a crash/ride. The Thin crashes don't feel substantially thinner than their Medium equivalents, but respond very differently. They are quieter, deeper and more restrained. The 18" model again has a very useable bell - if anything it sounds even better than the Medium crash in this respect. The three Powerful crashes are much heavier, louder and harder-sounding. They explode into life with an almost glassy-brightness and are cutting as a result. The 18" and 19" models are wincingly loud, but the 20" is quite intense. The sole Soundcaster china is an 18" example. It opens with a sharp, trashy attack and ﬁzzes enthusiastically over a discernible ping when ridden. There are three rides available - two 20" models and the outrageous 22" Mega Bell ride. The ﬁnish and the weight of the cymbals means that toppy characteristics tend to dominate. The 20" Medium ride is high pitched and gives a clean 'ping' over a light wash. The 20" Powerful ride is higher still in pitch and the stick sound is glassy everywhere except on the bell, where it is suitably strident. The 22" Mega Bell is in another league. The bell extends almost halfway down the cymbal, and it is twice as loud as the other rides. Weighing almost 4kg, it would have problems ﬁtting into a normal cymbal case. It possesses all of the tonal subtleties of a radiator, but is brutally, if not dangerously loud.